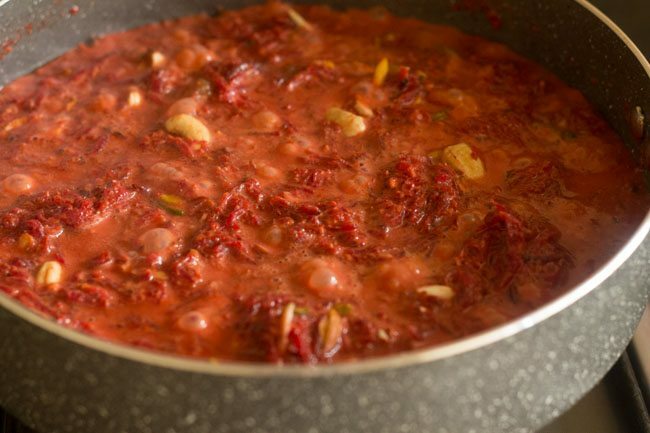 a delicious halwa made from beetroot, mawa (evaporated milk solids), milk and dry fruits. 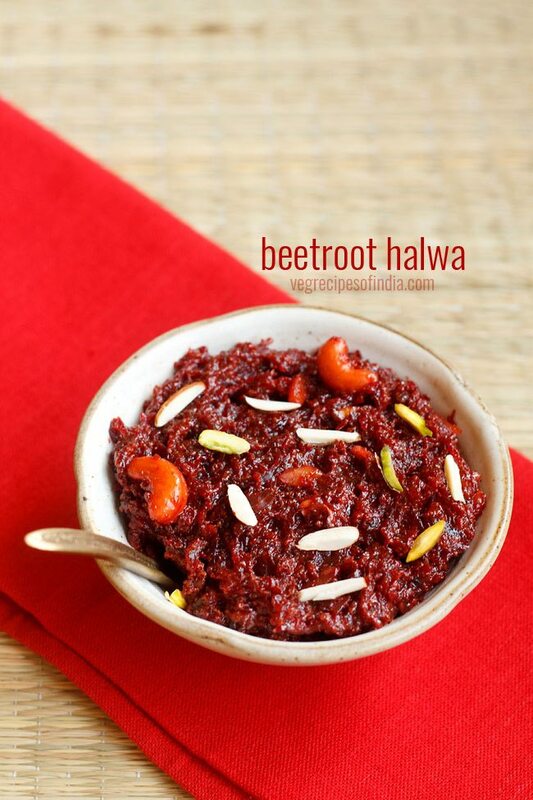 quick beetroot halwa recipe with step by step photos. 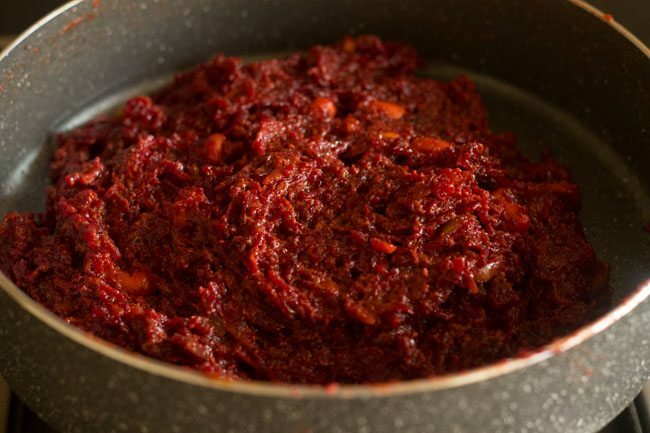 a quick version of beetroot halwa made with khoya or mawa. 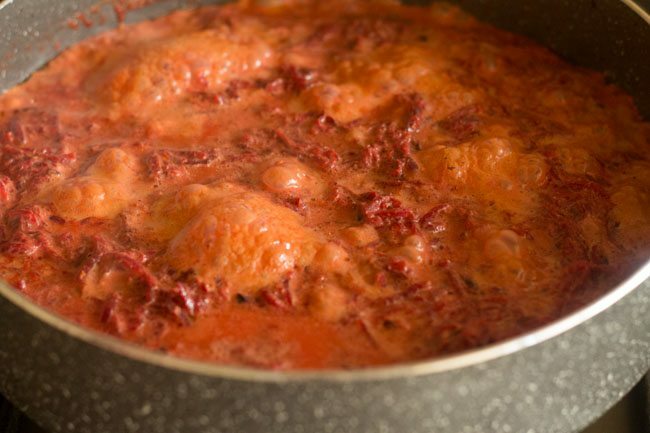 i have already shared beetroot halwa recipe slow cooked in milk. 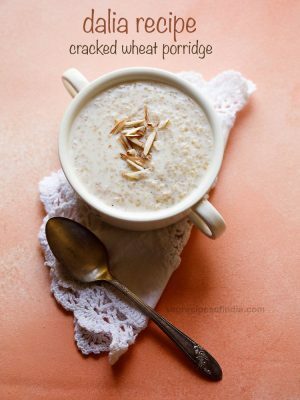 the slow cooking and simmering in milk takes a lot of time but this recipe is a quick as well as an easy version. 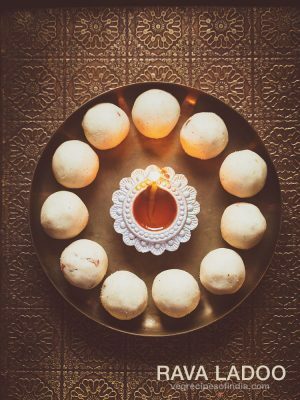 so thought of sharing the recipe for diwali. the crimson reddish color on the halwa looks so pleasing to the eyes. if you taste the halwa, you won’t get the beetroot flavor and the halwa tastes similar to gajar halwa. i have added more dry fruits in the halwa. 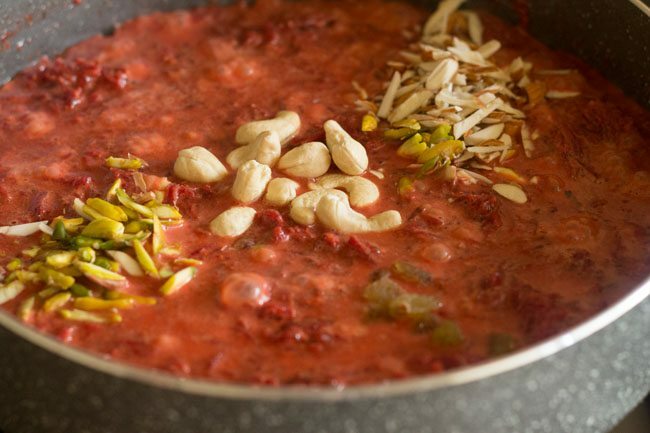 you can also make this halwa with less or no dry fruits. 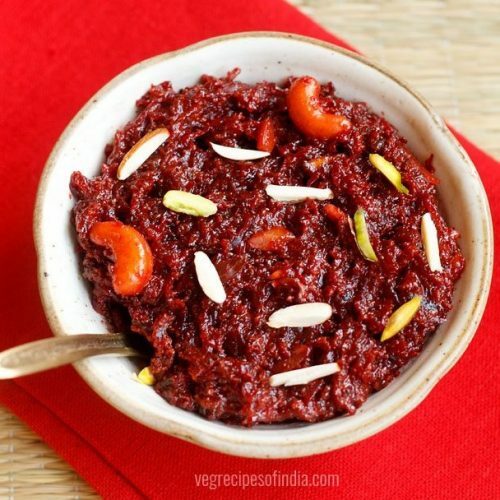 serve khoya beetroot halwa as a dessert after meals or as a sweet. you can make this halwa ahead of time and refrigerate. it stays good for 4 to 5 days. rinse and peel 4 medium sized beetroots. 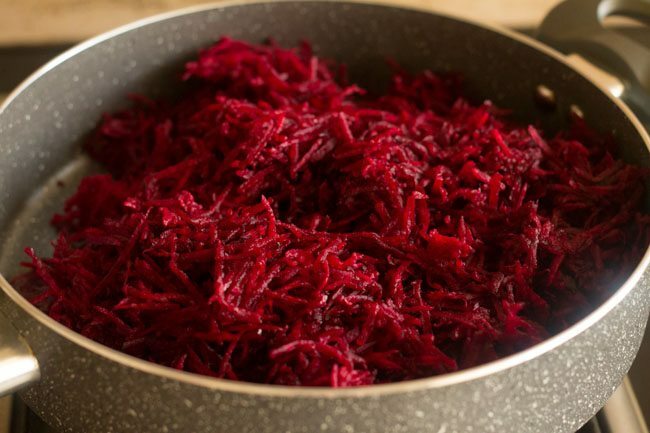 use a hand held grater or a food processor or a food chopper to grate the beetroots. grate all the beetroots one by one. keep aside. heat 1.5 cups of milk in a vessel, till it comes to a boil. keep aside. chop the dry fruits and keep all the ingredients ready for the halwa. 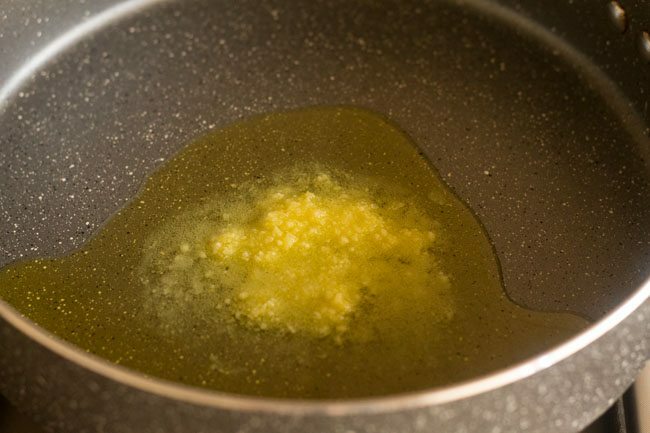 heat 3 tablespoon ghee in thick bottomed pan or kadai. 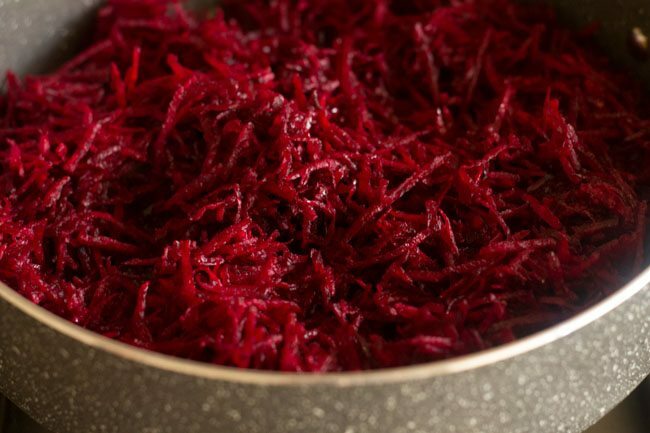 saute and stir the grated beetroots in ghee for a minute. cover with a lid and cook for 4 to 5 minutes on a low flame. do check a couple of times and stir. after 4 to 5 minutes, remove the lid and pour the hot milk. stir and mix well. on a low flame, cook the beetroots in milk for 4 to 5 minutes. 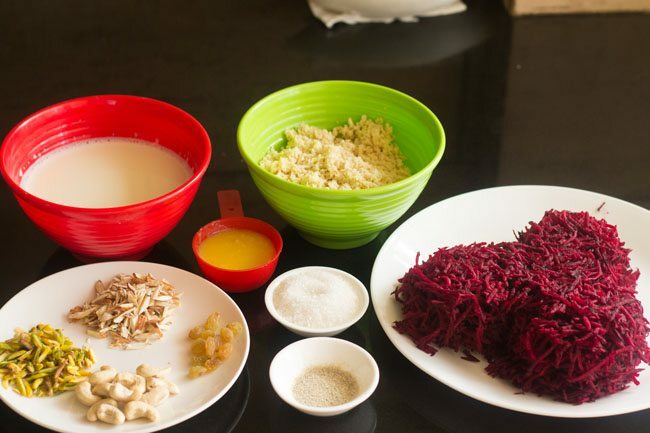 the grated beetroots will cook in the milk and the milk will start reducing. now add 1.5 cups of grated mawa (evaporated milk solids). stir and mix well. 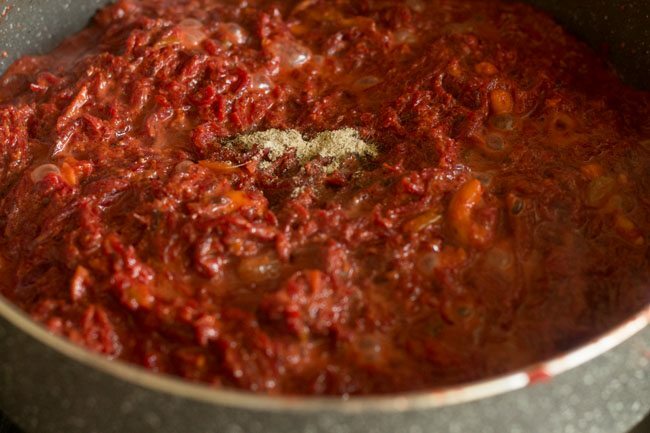 simmer the mixture for 3 to 4 minutes. add 4 tablespoons sugar or add as required. stir and mix well. add the chopped almonds, pistachios, cashews and raisins. stir well. 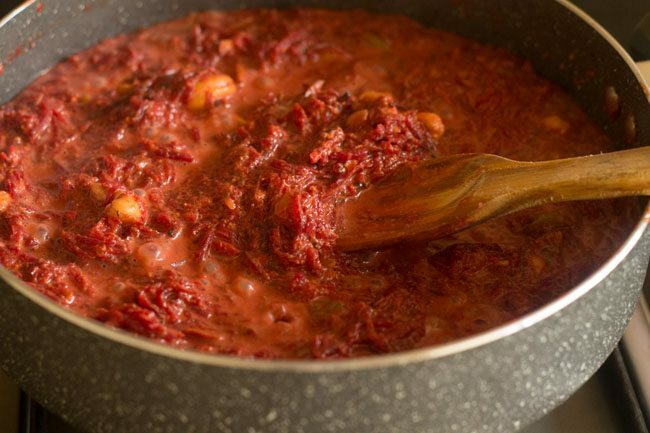 continue to stir and cook, till the beetroot halwa thickens. sprinkle ⅓ teaspoon cardamom powder and mix well. 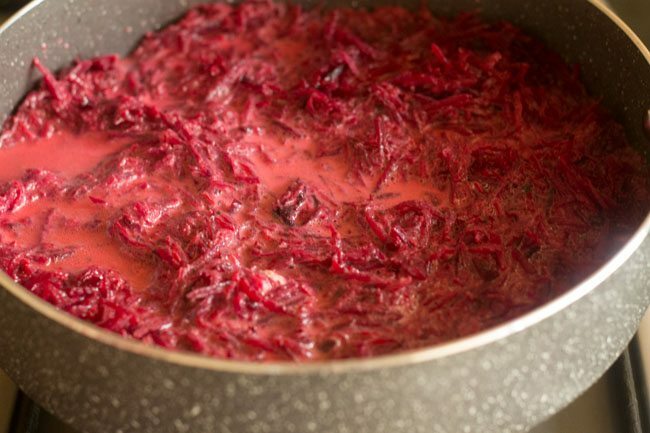 soon you will see the beetroot halwa leaving the edges of the pan. serve khoya beetroot halwa hot or warm. 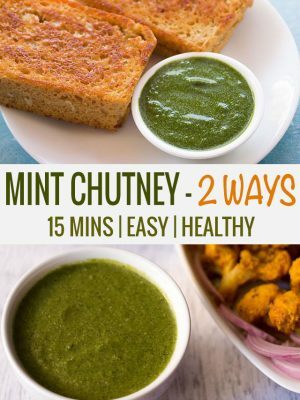 you can also refrigerate the halwa for 3 to 4 days. 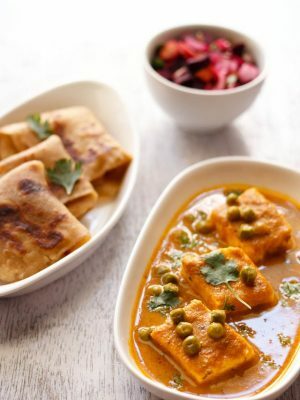 adding dry fruits are optional. add sugar as required, as the beetroots are sweet. so add sugar accordingly. 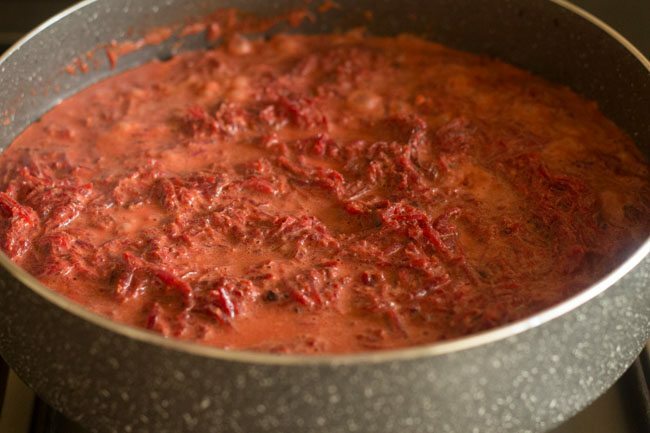 cook the beetroot halwa on low flame and keep stirring at regular intervals. 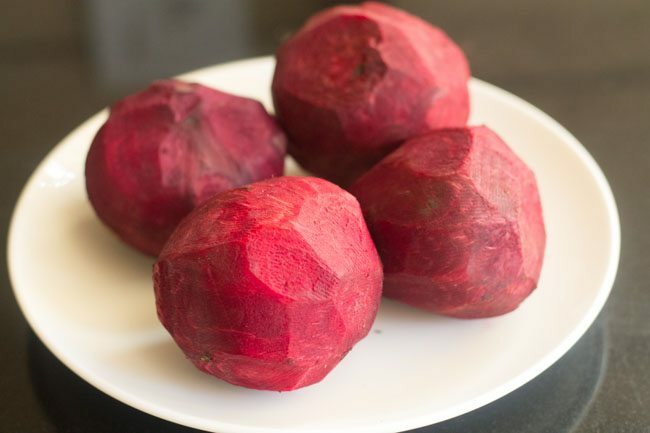 1. rinse and peel 4 medium sized beetroots. 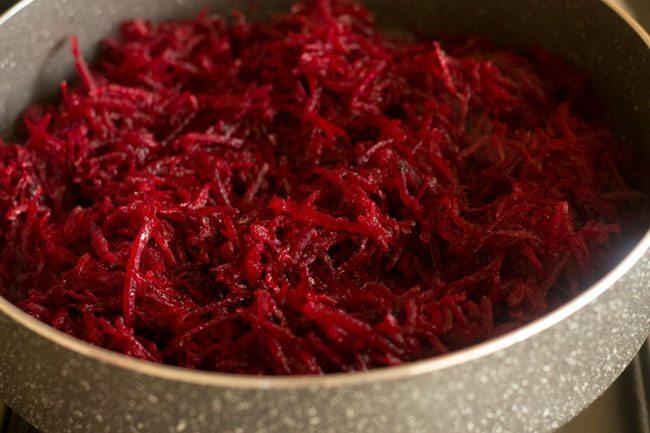 2. use a hand held grater or a food processor or a food chopper to grate the beetroots. grate all the beetroots one by one. keep aside. 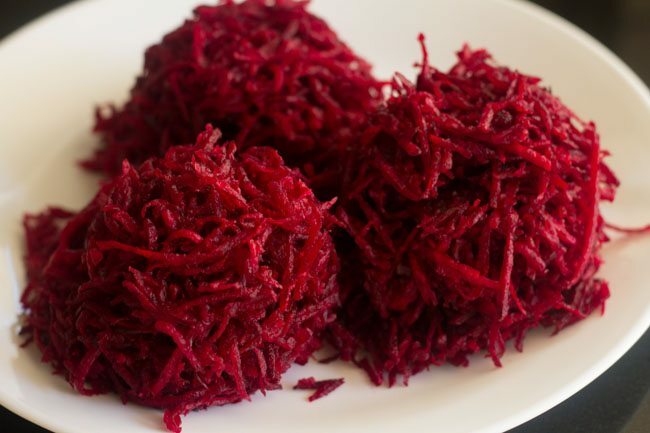 you will need 3 cups grated of beetroot. 3. first heat 1.5 cups of milk in a vessel, till it comes to a boil. keep aside. 4. chop the dry fruits and keep all the ingredients ready for making halwa. 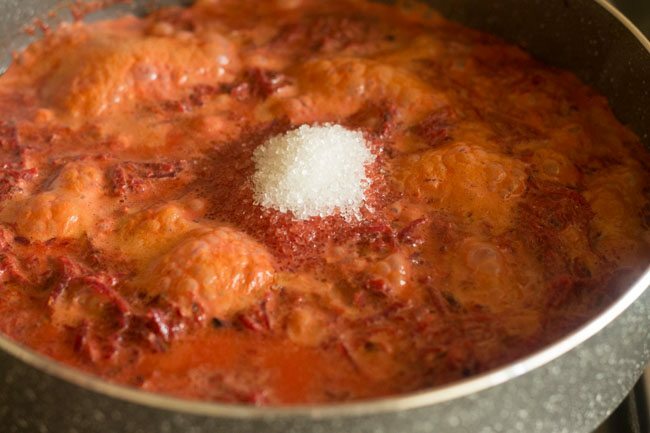 5. heat 3 tablespoons of ghee in thick bottomed pan or kadai. 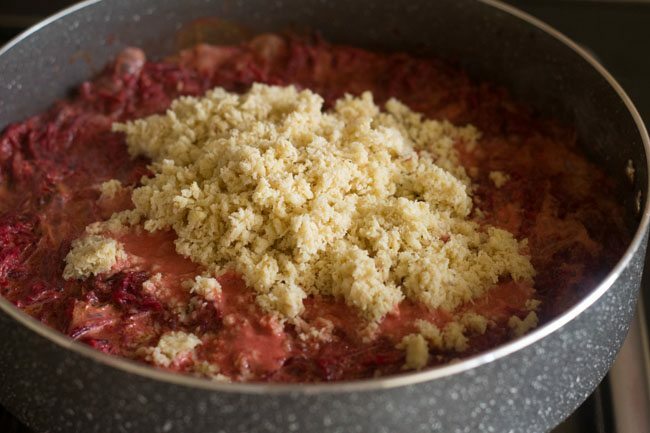 6. add the grated beetroots. 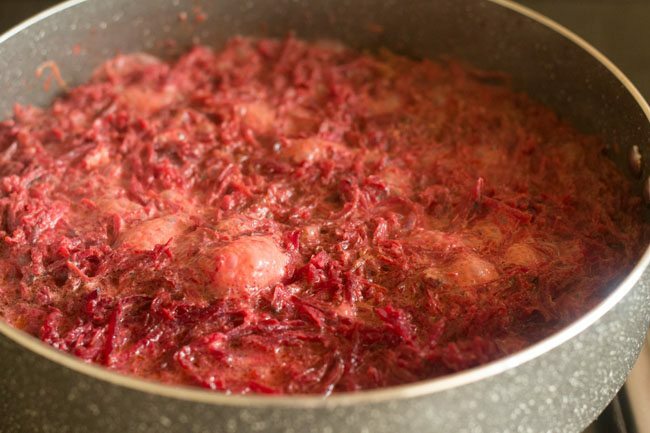 7. saute and stir the grated beetroots in ghee for a minute. 8. cover with a lid and cook for 4 to 5 minutes on a low flame. 9. do check a couple of times and stir. 10. after 4 to 5 minutes, remove the lid and pour the hot milk. 11. stir and mix well. 12. on a low flame, cook the beetroots in milk for 4 to 5 minutes. 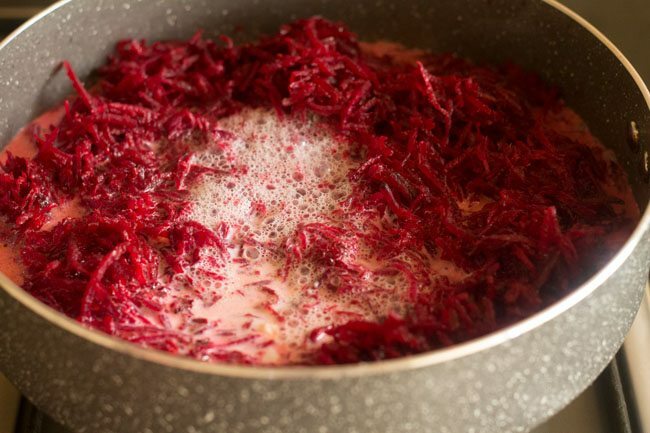 the grated beetroots will cook in the milk and the milk will start reducing. 13. now add 1.5 cups of grated mawa (khoya or evaporated milk solids). 14. stir and mix well. 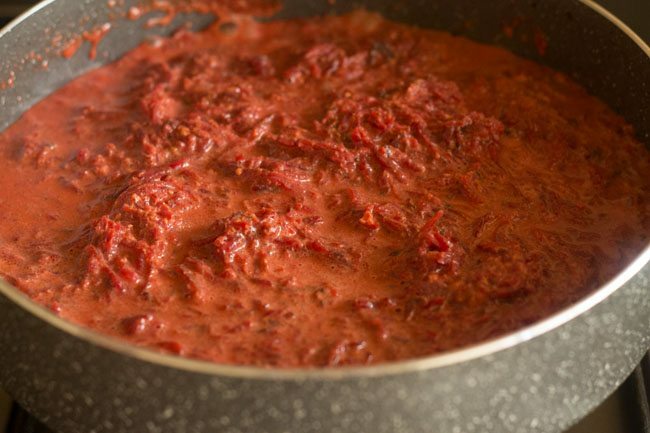 15. simmer the mixture for 3 to 4 minutes. 16. add 4 tablespoon sugar or as required. 17. stir and mix well. 18. add the chopped almonds, pistachios, cashews and raisins. 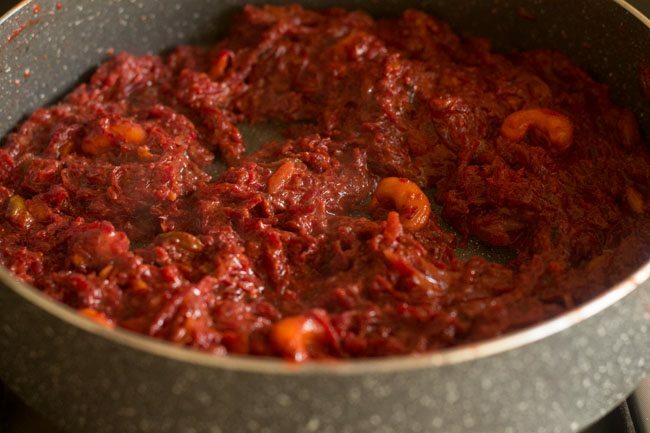 20. continue to stir and cook, till the beetroot halwa thickens. 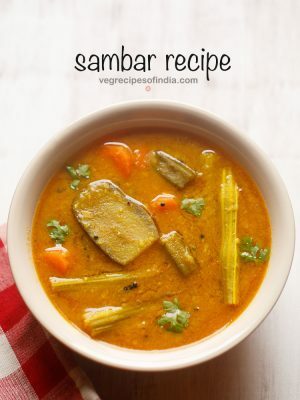 21. sprinkle ⅓ teaspoon of cardamom powder and mix well. 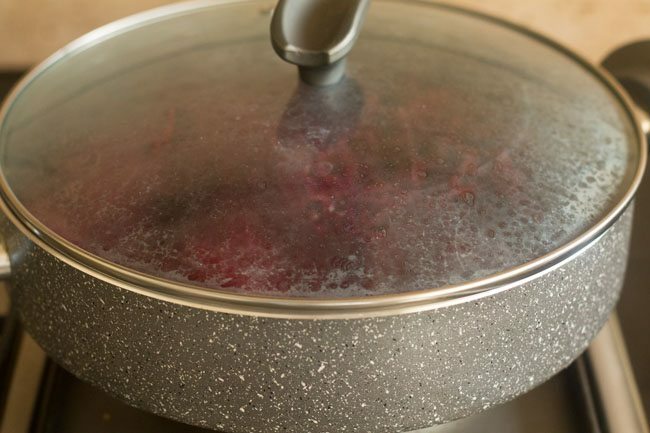 22. soon you will see the beetroot halwa leaving the edges of the pan. 23. switch off the flame. 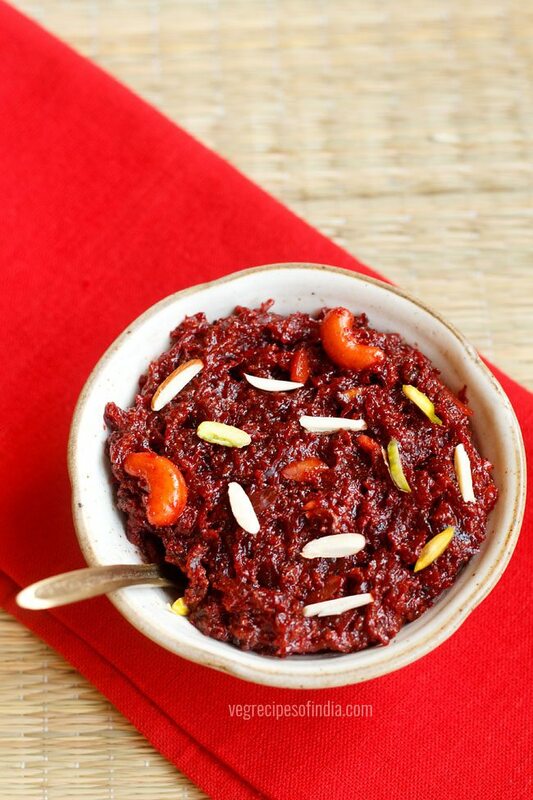 24. serve khoya beetroot halwa hot or warm. you can also refrigerate the halwa for 3 to 4 days. i’ve maked this halwa at cooking competition today at school.and it was liked by all teachers. 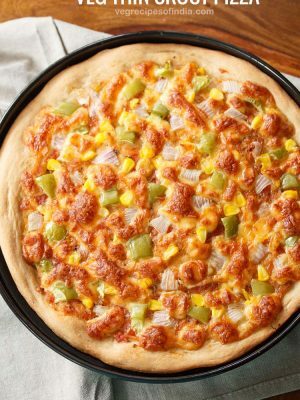 thanks for your help and recipe. thanks pushpendra. nice to know. all the best for your future. i want to tell u that i have won the 1st prize in that competition.once again a bag full of thx for ur recipe and u .
welcome pushpendra. yes i remember you. glad to hear this positive news. wish you lot of success. Beetroot Halwa looks so yummy & colourful. 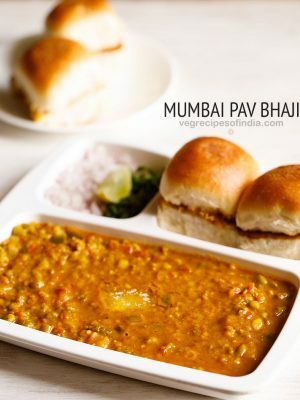 Mouthwatering dish.. Can i use condense milk in this recipe?? If yes than in which step i have to add.?? 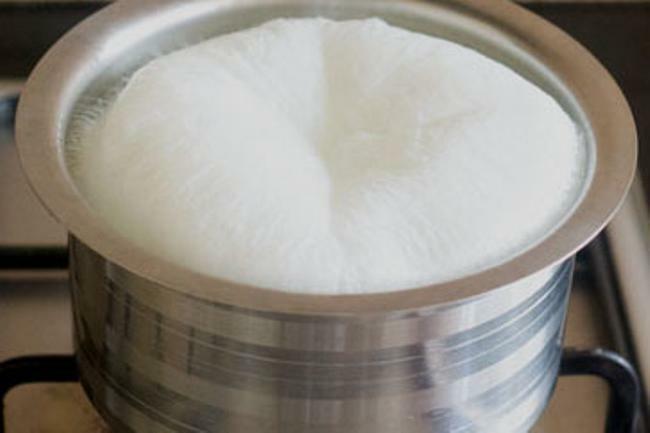 priyanka, you can use condensed milk, but then skip or reduce the sugar. add it in step 12. and continue to cook till the mixture thickens. add about 200 grams of condensed milk. meaning if using a can of 400 grams, the add half of the can.